I love beef – in all shapes, sizes and flavour! This Vietnamese Lemongrass Beef and Rice Noodle Salad (Bún Bò Xào) is a perfect example of the sharp, crystal clear flavours that personify much of South East Asian cooking. Okay, okay, let’s forget the coconut milk for a second and try that sentence again, shall we? I learnt to make this dish from a very old and wise Vietnamese lady, much like my granny, during one of my stays in Vietnam, many moons ago. Let me break down the Vietnamese name for today’s recipe because I’ve seen so many stupid, yes stupid, English translations out there, even by people who should know better! It’s a heavenly salad, much in the fashion of the Burmese Let Thohk Sohn (Rainbow Salad), with the lemongrass beef and all its drippings sitting on top of a bed of rice noodles alongside salad ingredients, topped with crushed peanuts. Add to this, a piquant, aromatic, homemade dipping sauce that I like to drizzle (pour?) all over – oh my, I get palpitations just thinking about it! Ideally eaten at room temperature, I’ve just as often served it warm to my husband who dislikes (for want of a better word) anything not warm! And you know what? The lemongrass beef itself is perfect served over a bowl of steaming Jasmine rice, just like the Japanese Beef Shigureni. A good quality cut of beef is essential as we’re only briefly cooking the meat, in fact, keep it pink in the middle the way I do. So we need tender cuts of beef that require minimum cooking. Tender cuts come from the middle – the rib and loin – as these are support muscles that have less connective tissue because they get less exercise. 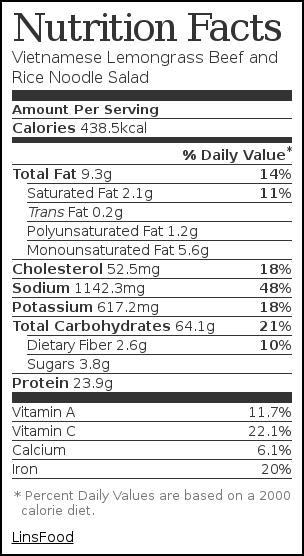 What’s perfect for this recipe? Sirloin – lean and boneless, great for all quick cooking, my favourite. At the end of cooking time, I like to add a couple of tablespoons of water, just for a little bit of sauce, but traditionally, it’s kept dry and the rice is moistened but the drippings as well as the dipping sauce. 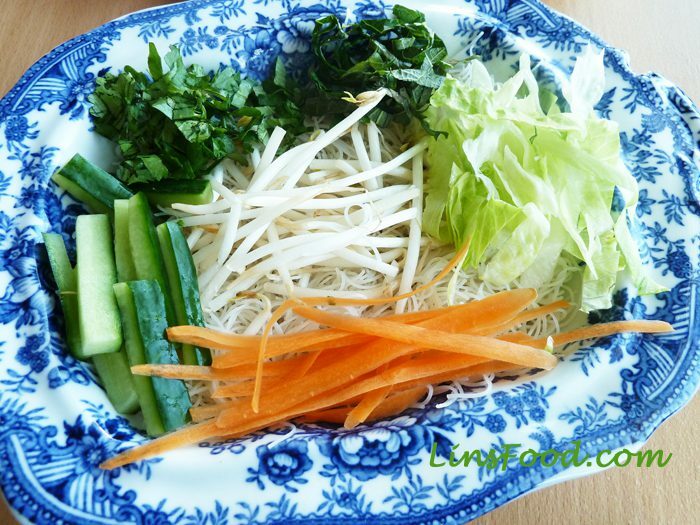 The rice noodles – rice vermicelli, the really thin kind, like angel hair pasta. I can get the fresh version here in the UK, very easily in most major supermarkets. You can always use the dried version and follow cooking instructions. Just before serving, I quickly toss the noodles in a tablespoon of sesame oil for added flavour. Marinade the beef with half the lemongrass and fish sauce while you get the salad ingredients ready, you know, the chopping, etc. You can either assemble the salad or just place everything on the table and let everyone help themselves. 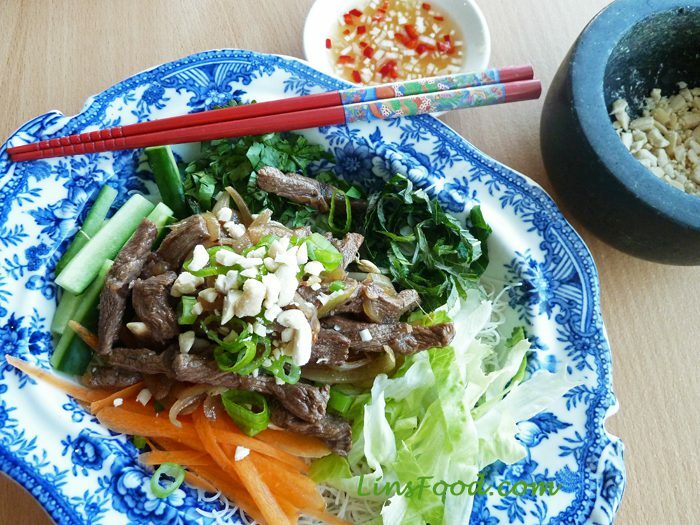 Vietnamese Lemongrass Beef and Rice Noodle Salad is a substantial Vietnamese salad with vegetables, starch and protein and eaten with a piquant sauce. Marinade the beef with half the fish sauce and lemongrass while you get everything else ready. You can even do this hours ahead or the night before. Mix everything together and keep aside. Can be made a day earlier and kept, covered, in the fridge. Will last 2 days in the fridge. Heat the oil in a large frying pan over medium high heat and sauté the onions for a minute. Add the garlic and lemongrass and continue for 30 seconds. Add the beef strips, turn the heat up and mix thoroughly, stirring vigorously, for 30 seconds. Add the rest of the fish sauce and continue cooking on high heat for 1 minute for pink in the middle or as done as you prefer. Add the pepper and water if using, stir, turn heat off. Check for seasoning, add salt if necessary. Leave aside while you assemble the salad in individual portions or take it all to the table for diners to help themselves to. Bean sprouts and rest of the fresh stuff on and all around, see picture. Leave the sauce on the side for actual dipping too. For a stronger flavour, marinate the beef for a couple of hours or even the night before.